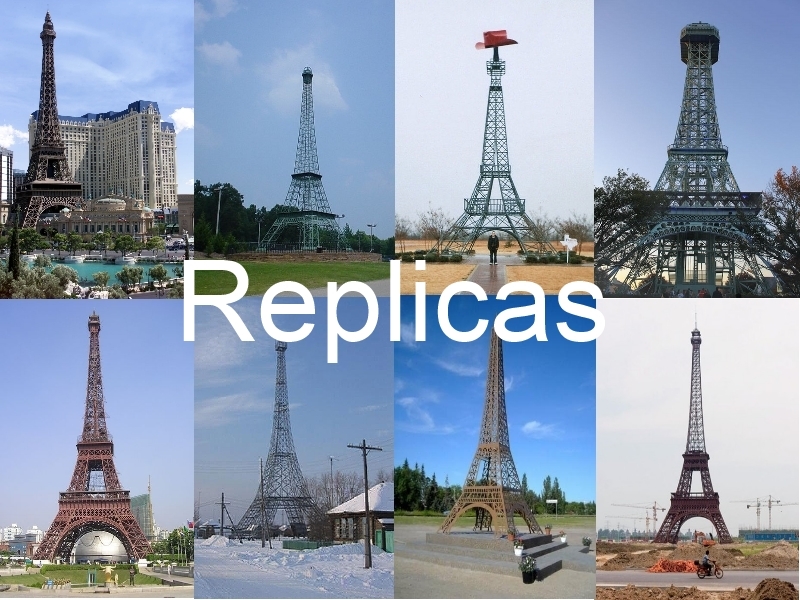 People dream to replicate iconic Eiffel Tower, and many have made it worldwide. I am one among them who handcrafted this structure with Bamboo sticks in 1994 for first time. Now again in 2013 re-created it with finest details. This miniature is 3 foot 6 inches height. This structure of Paris was completed in 1889. 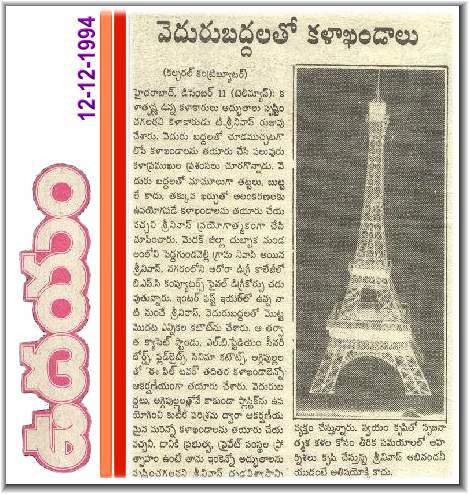 At the time of building it was the tallest in the world. Work started in January 1887 with 300 on-site employees took 2yr 2months to complete. This iconic tower having 18,038 pieces joined by two and a half million rivets. It weights 7,300 tonnes, while the entire structure including non-metal weight 10,00 tonnes approxmately. Height of the tower varies 15cm due to temparature. 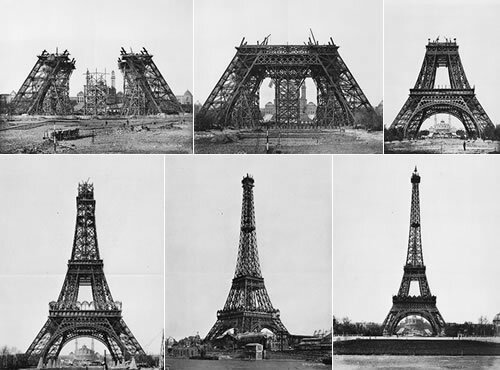 As one of the most iconic images in the world, the Eiffel Tower has been the inspiration for the creation of over 30 duplicates and similar towers around the world. The Eiffel Tower is the inspiration for many other towers built worldwide. 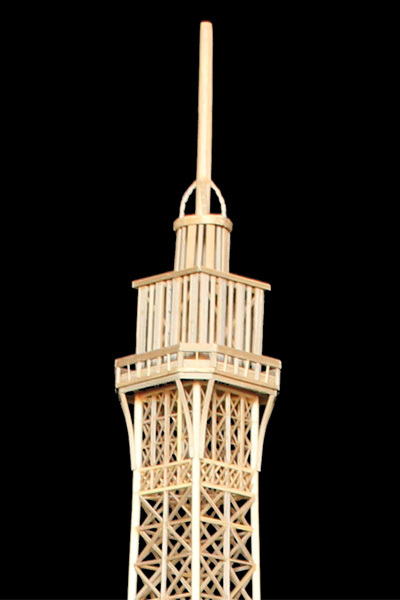 Over 10 replicas build in USA compared to other countries. .
A simple bamboo pole turned into a beautiful Eiffel Tower using simple tools and wood glue. 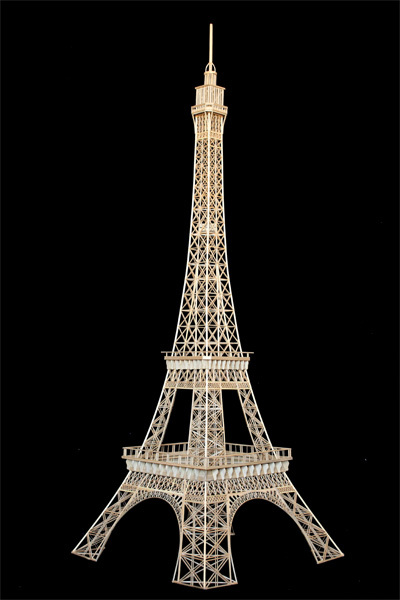 This miniature model is 3'6" tall and having over 2700 pieces of Bamboo Sticks. 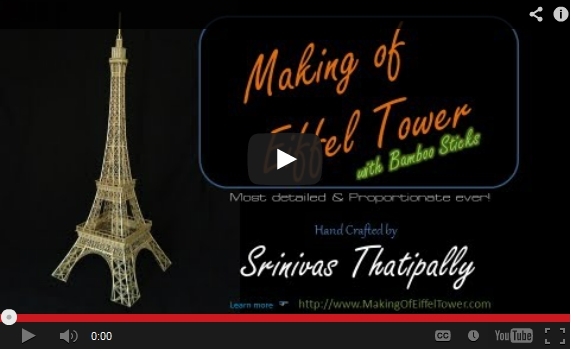 Watch the short video presentation of the making of eiffel tower and get answers for many common questions. 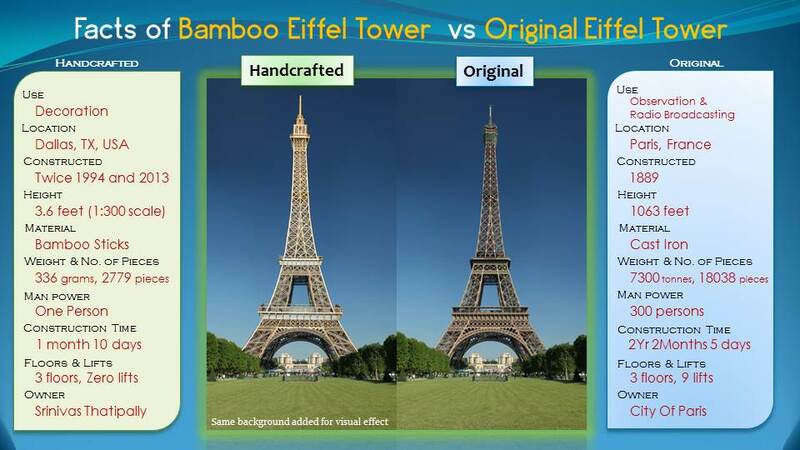 A quick glimpse of the comparisons and facts of the handcrafted miniature Bamboo Eiffel Tower Vs the original Eiffel Tower. 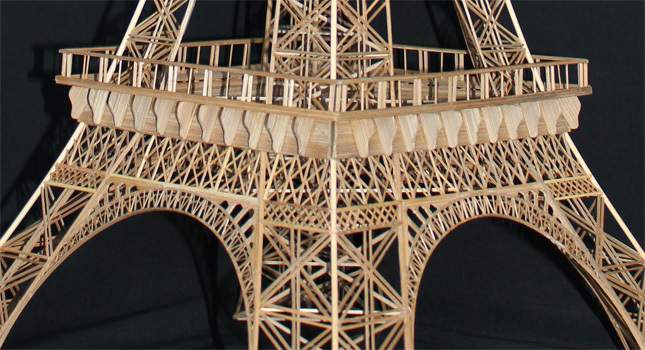 Why HandCraft The Eiffel Tower? Eiffel Tower one of the man-made wonder of the world, is an inspiration to thousands of art lovers. People have made miniatures of this special tower with various materials like matchsticks, popsicle sticks, bamboo sticks, paper,wood etc. I personally have made this tower twice so far in 1994 and again in 2013, and the reason to repeat is simple it gives me immense satisfaction and happiness.For some people this might look simple and for some this might appear as useless and waste of time. Whatever it is, these projects elevates your creativeness and inner talent. 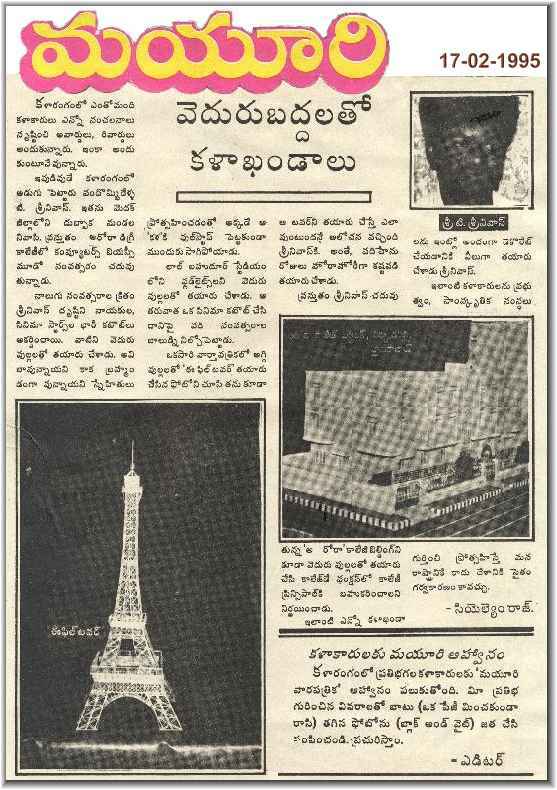 Such projects require good creative skills, engineering ideas, planning and most importantly passion and patience. So if you are passionate to do it.. Just do it!! If you are worried even a bit as to how to start about then you can pick some Hobby Kit and experiment it..it's as simple as that.. Just keeping going!!. 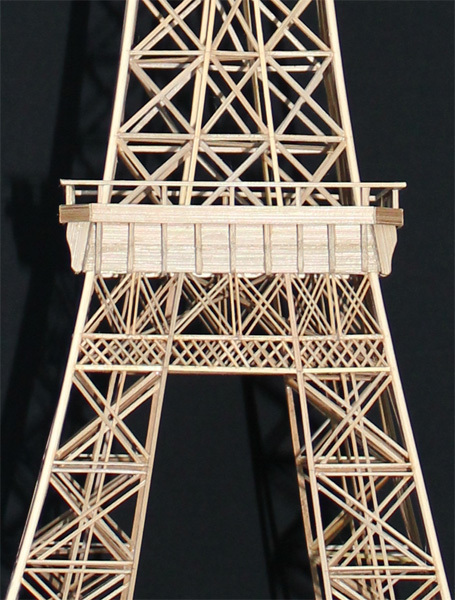 Here are some pictures of Bamboo Eiffel Tower which I built in 2013. 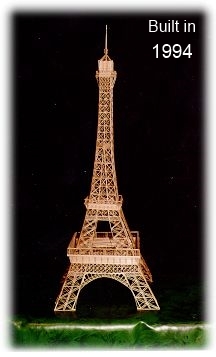 This is my 2nd Eiffel Tower Model after 19years. 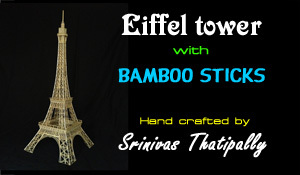 In my teenage, I made several handcrafted projects, the best being bamboo Eiffel Tower. 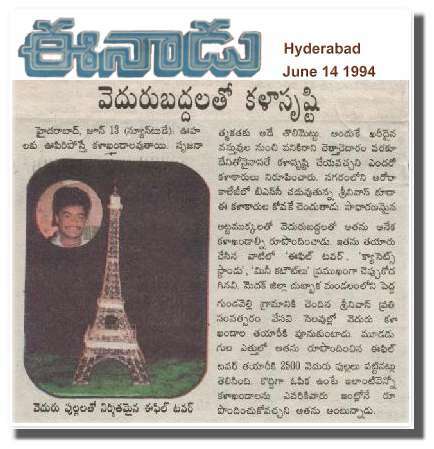 It attracted the regional media and my articles were published in several news papers like Eenadu, AndhraJyothy, AndhraPrabha, AndhraBhoomi, Udhayam, Mayuri etc. Machitecture is having easy to build miniature kits on famous land marks like Taj Mahal, Tower Bridge of London, Empire State Building, Chrysler Building, Toronto CN Tower, Statue of Liberty and also many more simple kits.